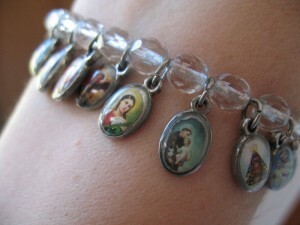 Coolest bracelet ever (each medallion is a different saint). Also cool: there’s a book giveaway at the end of this post. It’s fair to say that the saints and I have had an interesting history. As a kid with a vivid imagination, tales of gruesome martyrdoms positively freaked me out. For years, I assiduously avoided books about the saints. But as an adult, I’ve grown to see the saints as friends. I ask my favorites to pray for me in the same way I might ask a buddy to do. I read about their lives in the same way I would read about the life of a writer or artist I admire: because it’s fascinating to learn how someone grew into the person they became, and because their lives inspire me to achieve my own full potential. And the thousands of different saint stories all bear witness to a fundamental truth: each of us is unique, and each of us has our own unique path to travel. There is not simply one way to be holy. So I’m always on the lookout for good books on the saints. 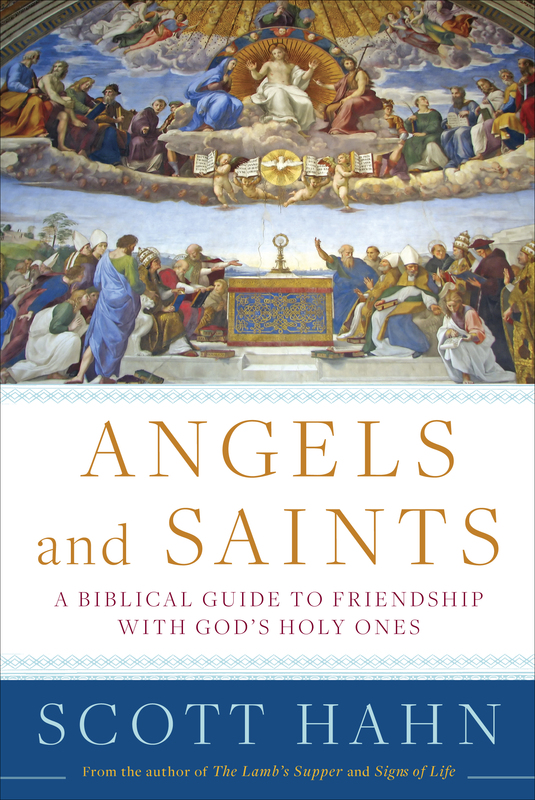 Dr. Scott Hahn’s new book Angels and Saints: A Biblical Guide to Friendship with God’s Holy Ones is one of them. What I enjoyed most of all was how Dr. Hahn devotes the last half of the book to telling the stories of a sampling of different saints and angels throughout the centuries. One of them is St. Maxilimian Kolbe, often called The Saint of Auschwitz. Kolbe was a Polish priest who was arrested by the Gestapo and ultimately taken to Auschwitz. On a July day in 1941, the guards found that one of the prisoners was missing and presumably had escaped. In retaliation, they randomly chose ten prisoners to die by starvation. One of them, Franciszek Gajowniczek, instantly cried out for mercy, asking what would happen to his wife and children if he were killed. Hearing him, Kolbe suddenly stepped forward and offered to take his place. The guards agreed, and Kolbe and nine other men were sealed up in the starvation bunker. He died on August 14, 1941. I first heard this story in the early eighties, around the time that Kolbe was canonized. As a Polish-American, I felt connected to him that way, but though my young mind could intuit the astonishing sacrifice he’d made, there was so much of his story that I simply couldn’t grasp as a child. I couldn’t grasp the enormity of evil that was Auschwitz. I had no sense for what a slow, agonizing death starvation must have been. I couldn’t fully understand the terror of being sealed up in a dark place in the knowledge that you would never leave it. Now, I think I have a clue, and the man’s courage staggers me. But it’s as a mother that this story resonates with me most. 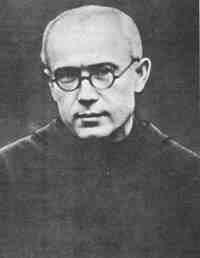 Kolbe’s sacrifice was prompted by Gajowniczek’s agonized cry of distress about leaving his family. Kolbe must have realized, in that brief moment, that the death of a father would also mean the destruction of a family. It would mean a wife without a husband and children without a father. He died not just for a man right in front of him, but also a woman and children he would never see. 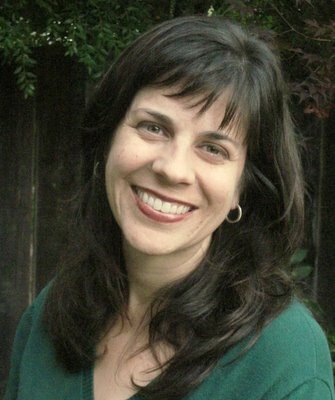 As a wife and mother, I can’t begin to verbalize what that action would mean to me. Some kinds of gratitude can’t be captured in words, just as some kinds of heroism can’t be captured in words, either. Franciszek Gajowniczek survived the war. His wife did too, though tragically, both his children were lost in a Soviet bombardment in 1945. He was present at the canonization of Fr. Kolbe in 1982, and until his death at age 94, he did what he could to speak about and honor the man who volunteered to take his place. As I read this chapter of Angels and Saints and reflected on Kolbe’s story, I thought about how it’s a story of sacrifice writ large, as large as it can possibly be. It’s a story of extreme courage, extreme charity, and it’s one glimpse into the goodness that we humans are capable of. Perhaps each saint shows a different kind of goodness, some small facet of the overall picture of a human being at once fully realized and fully holy. I’m very glad that Dr. Hahn wrote this book, shedding more light on the thousands of men, women, and angels who make up the “great cloud of witnesses” and inspire us to our own goodness. But on second thought, maybe the verse is fine just as it is. Perhaps one mark of a saint is that there are no strangers, only friends. 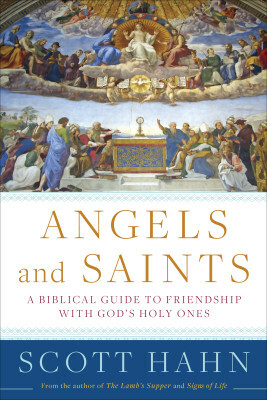 Angels and Saints is published by Image Books, who has generously offered to give away a copy to a lucky winner. Enter using Rafflecopter below. Entries close at the end of the day on June 10th. HOW TO ENTER: After entering name/email address (or signing in with Facebook), click on the button that says +1. A window that will pop up saying “Leave a comment.” You don’t actually have to leave a comment; just click on the button saying “I commented”, and you’re entered! And if you’d like to visit the other stops on the blog tour — each one featuring a reflection on a different saint — check out the full list here. 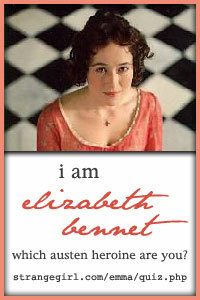 This entry was posted in Blog tour, Uncategorized. Bookmark the permalink. I would like to read about the angels and saints. Great, Karen! I’ll add you to the Rafflecopter giveaway. Thanks, K.L. — I made sure your name is in the Rafflecopter list.